Have you ever stopped in the middle of a long day, afternoon in the garden, or drive home from the gym, feeling tense, and realize your shoulders are up around your ears? You're not alone. That's where most of us tend to carry stress, and it happens without your even realizing it. 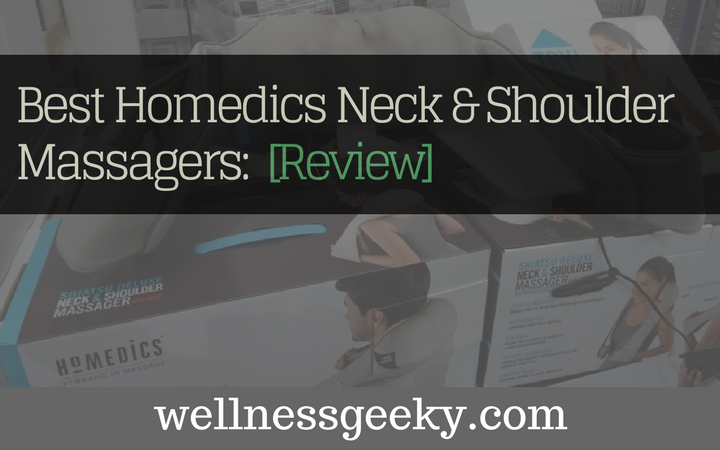 The good news is no matter where you tend to hold stress; there's a HoMedics neck massager that will have you feeling relaxed and pain-free in no time. HoMedics is a name you can trust in home massagers, cushions, and pillows. They create high-quality products and have a loyal customer base and excellent customer service. Here's a review of their top models. If you're a fan of the latest technology and you're looking for a good shoulder massager or the best device for delivering a soothing neck massage, you might just fall in love with the Cordless Shiatsu Talk Voice Controlled Neck and Shoulder Massager (NMS-675H). It's got optional heat, which is always something I look for, but the two features that make this a top pick for me are the enhanced back portion area and the fact that its voice activated. Hands-free operation gives you that much more flexibility and convenience. And the back area of the massager extends a bit further down than many of the other models, increasing the area you can treat. The deep tissue Shiatsu kneading massage is heaven sent. You can vary the speeds from intense to work out kinks, knots, and tight muscles, all the way down to a gentler low for pure relaxation in your neck, shoulders, and back. The fact that it runs on a rechargeable lithium battery is great because you can take it anywhere (It's easy to take it to the gym or with me when I travel), and you never need to deal with finding an outlet. If voice activation isn't your bag, but a more diversified and medium-high intensity Shiatsu massage is, then the NMS-620H might better suit. The NMS-620H uses a quad action system, and you get both the deep tissue kneading action that you're probably familiar with in a Shiatsu massager, combined with vibration. You can use one or the other on its own, or combine them for a very deep massage that will work wonders on easing out your sore muscles, stress, and tension. You can vary the speeds (there are three levels) and add heat if you want to aid in loosening up sore, tight muscles. Twenty minutes will really rejuvenate you with this powerful, but not a too powerful massager. When it comes to neck massage, it's important to find the right level of intensity, as sometimes more isn't more. The MNS-620H has just the right amount, so you don't feel like you're getting the you-know-what kicked out of you. You just feel blissful relaxation and stress relief. It isn't cordless, so bear in mind you'll need to plug it in, which is why you get a bit more power than one that's battery operated. If you want to go big on deep tissue shoulder and neck massage, and you don't mind having to find an outlet, this is the massager for you. 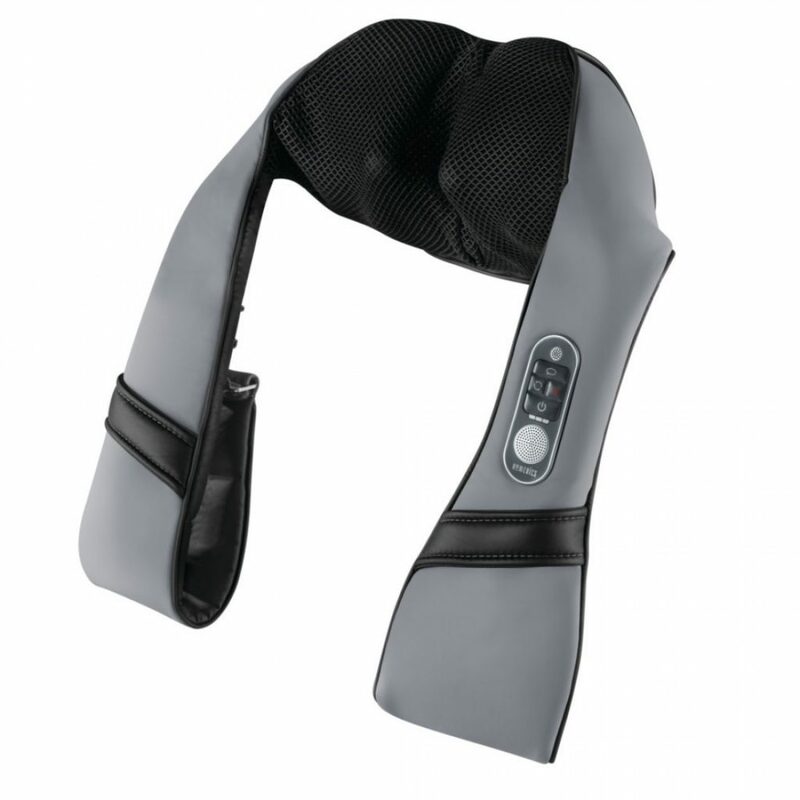 Similar to the NMS-620H, this neck and shoulder massager delivers the "just right" amount of intensity. It's not so rough that you're uncomfortable or even in pain like some high-intensity massagers, but it's deep enough to get rid of stress in your shoulders and neck and work out any tightness or soreness you have. You can also add heat if that's something you like, and you get the option here as well of a kneading shiatsu massage, vibration, or a combination of both. The key differences between the 620H and this one are the neck roller and intensity levels. The 375 has two rollers, whereas the 620H has four with its quad system. You also can't adjust the intensity level like you can in the 620H. 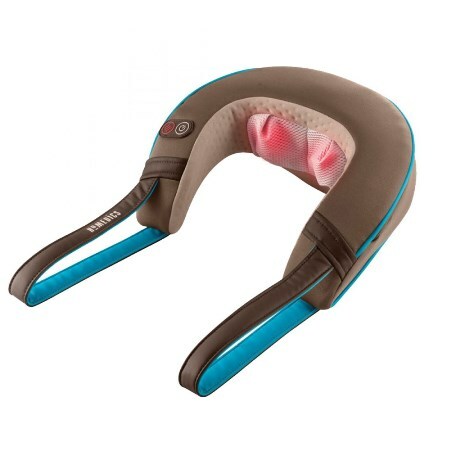 You can tug more snugly on the handles to manually adjust it by pulling it down deeper into your neck or tops of shoulders, but there are no mechanical intensity controls. Like the 650H, this is not battery operated, so you do need the power supply. 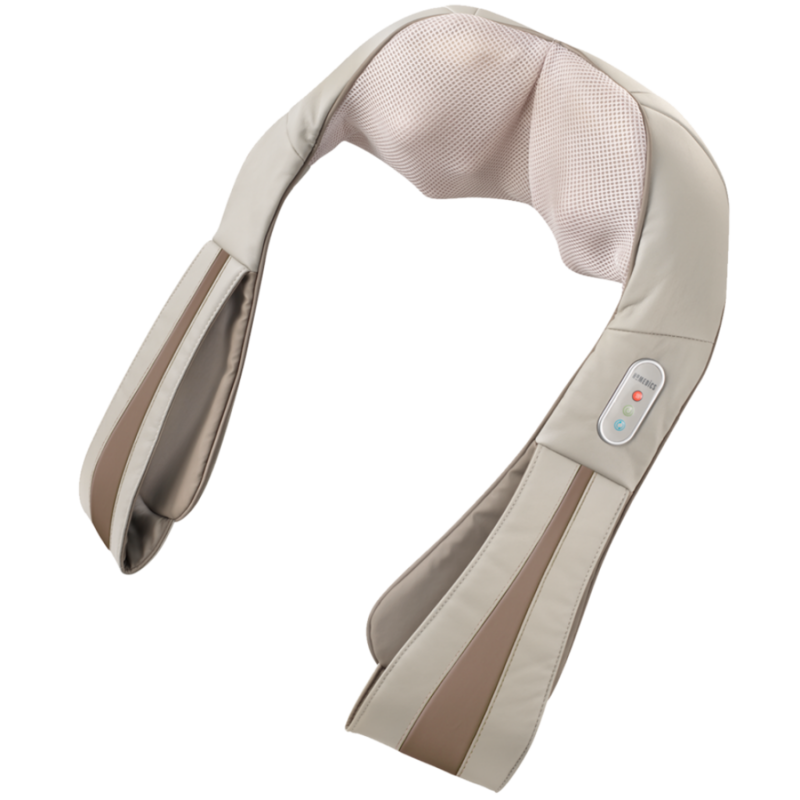 This is a very good mid-range shiatsu neck massager without a lot of added features. If you're looking for straightforward massage and don't want to break the bank, the NMS-375 is easy on the pocketbook. If you don't like kneading, deep tissue, or Shiatsu massage, but you do like vibrational massage, this is your massager. It has two speeds, and you can add heat if you like. It runs on battery, but it has an adapter, so if you prefer to plug in, you can. This is a very basic vibrating massage, which some people prefer, especially if you find the pressure of kneading rollers too aggressive. Especially on the neck area, kneading can be too much for those who are very sensitive. The difference between the Thera P NMS-230-THP and the rest of the lineup is that there is no kneading massage, just vibration. This is good for headaches and for easing out tension and stress. If the results you're going for are relaxation and stress relief, you might have a look at this one. It's the same price as the 375, which makes it a good baseline massager for the budget-conscious. Best for: Those who like vibrating massage, not deep kneading; budget-friendly; cordless. 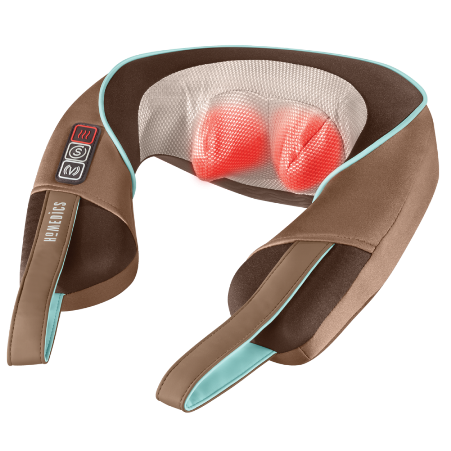 HoMedics offers a wide range of massagers, as well as smaller, more compact products like a cushion or shoulder pillow. You can find their home therapy products at several stores, and of course, online. Whether you like a feature-rich, technologically advanced massager that is hands-free and voice-activated, or an ultraportable cushion or pillow, like the Shiatsu Bedrest Plus (SP-130H), HoMedics has a model that will relieve your sore, tight muscles, and offer untold hours of relaxation and rejuvenation. Research has proven time and again that massage works wonders on relieving stress and anxiety, and there's no better course of action than daily in-home therapy.